Beef/Chicken that you will use for cooking Tomato Stew, Vegetable Sauce or Nigerian Rice Recipes. Beef/Chicken that you will fry and eat as a snack. Beef that you will use to make beef skewers or kebabs. Visit this link to learn How to Season & Grill Chicken. You only need a few spices to perfectly season your chicken or beef. There are a lot of spices that claim to be the perfect seasoning for your beef/chicken but this is not true. What these spices do is to take away the natural taste of your beef or chicken and make them taste somewhat artificial. To deep-season beef/chicken, you will need only the following ingredients. Wash the beef and put it in a bowl making sure there is as little water as possible in the bowl. Squeeze and sprinkle the stock cubes (Maggi or Knorr) on the meat. Then add thyme. Do NOT add salt yet. If you add salt now, it will seal up the pores of the meat and prevent the ingredients from entering into the meat. Using your hands, rub the meat so that all the ingredients are mixed with it. Cover the bowl and leave it to marinate (absorb the ingredients) for about 1 hour. If you have a thin plastic film, use it to cover the bowl, if not, no problems just cover it with whatever you have. You can place it in your fridge if you want. To start cooking, simply place the meat in a cooking pot, add onions and start cooking on medium heat. If you are seasoning beef, do NOT add water. For chicken, just add water up to the level of the chicken. Beef contains a lot of liquids so you will notice that the meat will produce a lot of water once it starts to simmer. Usually, this liquid should be enough to cook your meat till it is done. When the beef/chicken is done, add salt to your taste and leave to cook for about 2 minutes. Be careful so that you don't add too much salt. Stock cubes contain salt and sometimes this salt is enough to make the beef/chicken taste good. By this time, there will be as little water as possible in the meat. Transfer the beef/chicken to a sieve to drain. Add the beef stock (water from the beef) to your Tomato Stew, Jollof Rice etc when cooking. For Tomato Stew, add the beef/chicken when the Tomato Stew is completely done. 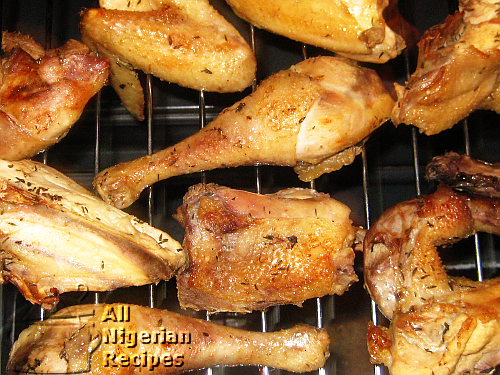 For Jollof Rice, you can fry or grill the meat/chicken and serve with the rice. Hope this will help you prepare the perfectly seasoned beef/chicken from now on.